I am pleased to welcome Simon Sherlock to The Wiggly Blog. He asked a perfectly valid question on cats and set the whole row off. Here's his attempt to sort the whole sorry tale out. From my point of view - sorry about podcast 68 - we lost it! thats all I can say. If you haven't listened to the show and are in a good mood - dont! And if you are in a bad mood - definitely give it a miss!! "Podcast 68 shows that the battle of the cat’s still rages on at Wiggly Wigglers and, highly amusing and interesting that I find said battle, I think it’s maybe time it was put to bed once and for all. But before it goes I’d like one last stir of the pot and to give a list of instructions, suggestions and products that can help both sides enjoy their garden and/or their pets. Firstly though, I’d like to address some of the points made in the podcast as, try as I might, I just can’t keep out of it, especially as my name was mentioned more than once as the person to blame for starting the whole thing off (even though I’m quite proud to say I did). The cat discussions always start with the killing of birds by cats, which is of course the extreme. And the RSPB get quoted as saying that cats mostly take old and sick birds that would die anyway. I would disagree slightly and say that cats take ‘vulnerable’ birds, so not only old and sick but also young and fresh out of the nest birds with the rest of their lives ahead of them (Oo, Must. Stop. Sounding. Like. Richard). Cat owners must be made aware of this and do their best to stop it happening whether by supplying their cat with a decent collar or bib (see list below) or by keeping them inside early morning and early evening (again see list below). From my side it is not so much the actual killing of birds that annoys me (though I’d prefer none to be taken) but the frightening away of the birds leaving me with a lovely colourful garden, bereft of the sound of wild life and the sight of birds flitting from branch to branch and hedge to hedge, with young birds in the nest demanding their next meal etc, etc. I’ve tried hard to make my small patch wildlife friendly and encourage birds, bees and other insects into my small garden on the edge of a rural Cheshire village; not only for my own enjoyment but also partly to try and teach my young children the wonders of nature at work and how you don’t have to live on an expansive farm or have a massive garden to do your bit and see the lives of other creatures unfolding around you. I agree with Heather that cat owners should not be expected to keep their cats inside all day. I would go as far as saying that this is cruel to the cat and if you intend to do this you should question whether you should be keeping one in the first place as, to me at least, it’s on a par with keeping a Killer Whale or Dolphins in a swimming pool. Heather is also right in that (most) cat owners do not set out to upset their neighbours by keeping cats. But just like when they buy a dog, or even have children, it is their responsibility to learn enough about their cat and it’s behaviour to try and stop it trespassing next door and running amok amongst the neighbours gardens. I liked the quote from somebody who said having a litter tray is a great way of stopping your cat from messing in your garden – in my experience they *never* use their own garden but instinctively know the neighbour who likes them the least and uses theirs! On the vermin control issue I agree with Richard; the majority of cat owners do not get cats for keeping the mice and rat population down, especially in urban areas but rather as an “easy” pet that takes less looking after than a dog or other pet because they are so independent. I don’t dispute that people love their cats but believe that much as they should bear some responsibility for their children and their (possible) collection of ASBO’s, so should they bear responsibility for the actions of their feline friend(s). - Do try and keep your cat indoors early morning and early evening as that is when birds are most active and feeding in the garden. - Do try and fence your garden. It is hard to keep a cat in even with a properly fenced garden but a strand of electric fence wire along the top of a fence (solar powered of course) will discourage them from walking along the top and jumping into next door. Of course they will find a way but this will at least make it slightly harder. - Unless you intend to breed cats have them neutered to discourage wandering (at least during the healing stage!) and stop the tide of unwanted kittens. - Get an ultra-sonic cat deterrent such as CatWatch from the RSPB (http://shopping.rspb.org.uk/mall/productpage.cfm/rspb/R0123) though be warned these will also send your dog potty. - Grow plants that cat’s dislike such as holly (under the bird table) and 'Scardy Cat' (Coleus canina), which gives off a right pong to cats but only affects humans when they touch it. 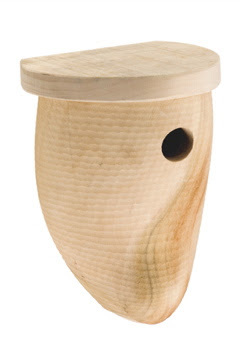 - Position feeders and bird tables to make it harder for cats to get at i.e. high off the ground and far enough away from things so that cats can’t jump to them. - Position nest boxes where cats cannot reach them or sit close to them (preventing the parent birds from getting to the box). - Avoid putting food on the ground where stalking cats can be a problem. - Buy a Jack Russell. Jack Russells love cats! Unfortunately they also like yapping and tearing your house to pieces, but if you can stand that, they are excellent pets. - Use a children’s soaker gun such as a Super Soaker to frighten away trespassing cats. To be honest though, you have to spend hours waiting and cats are intelligent enough to wait until the nutter with the toy gun has given up and gone back inside before sashaying smugly through your garden. It will also just add to your anger when do spot them and you don’t have the gun or it’s empty. So best not to go there in the first place. I’m sure I’ve missed a few so please leave (sensible and law abiding) suggestions in the comments." I love "Catalogue Day" at Wiggly Wigglers. After several weeks of product development, photography, design, and printing the finished article arrives on the desk. And, everytime I say, "this is our best one yet, you know, our best one yet!" To us, and to many of our regular customers our catalogues are not just a sales tool they are art! We frame every cover for the office and appreciate the photography supplied by our customers such as John Harding and Mark Eccleston, as well as Michael our designer and on some occasions Rach, Jodie and the rest of the team. And so our specialist catalogue "Bird Deli" (which as the title suggests is just everything you need for your garden birds) is here, ready and waiting. If you are a customer your copy will arrive in a couple of days, and if you are not yet a Wiggly customer and would like a copy email karen@wigglywigglers.co.uk and she will pop one straight in the post to you! Time to put up your boxes and to celebrate just for e-news subscribers and blog readers we have half price Clog Boxes. Type S5770 for one and S5771 for a set of three into the Search Box and you will get them for half price. We've extended this offer until 21st Feb! Only one per household. I haven't any for a while thought, because I am on a diet with Anna Farmery - with a podcast and blog - of course! Check it out. has a great post on worms with lots of useful links - including me - Thank you Philip Voice for a great idea on how to change our carbon footprint - using worms. "Americans throw away about 96 billion pounds of food waste each year, according to the U.S. Environmental Protection Agency. Food items are the single-largest component of the waste stream by weight in the United States, and residents spend about $1 billion annually to dispose of scraps and leftovers." I think its a great idea to use worms and Bokashi to change all this, but the first thing we need to look at is the food that we throw away. Currently we throw away 50% of the food that we buy! Not only that but when you consider that on average we are overeating by 10-30%, we could make a drastic difference to our local economies if we invest the money that we are currently wasting on locally produced quality food. Oo, and we would bring smiles to all those dejected farmers too! Farmer Phil...on Day One clearing the yard! Last week we had the deepest snowfall here in Blakemere for over 20 years - over 8 inches. Now this snowfall brought much of Herefordshire to a standstill. Many roads were blocked and it was taking cars 4 hours to get through the city centre. But in our locality we are used to my brothers Billy and George taking on all the unclassified roads and clearing them before the snow gets a chance to stick. This year Farmer Phil was recruited to join the team much to his excitment. He made his snow plough and had the tractor fueled and ready for the call! 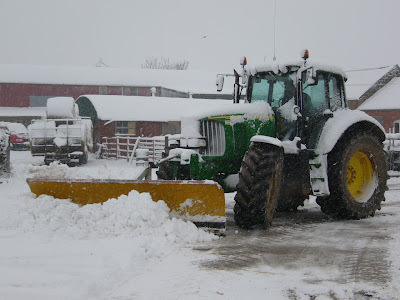 Day Two: Farmer Phil ploughs on in deepest Ruckhall ensuring the emergency services could get through and folks could get their essential supplies! Ah well, eventually we rescued him with the help of Kevin, Anthony, Jodie, and the Countrywide delivery man!! Always apply your own breathing mask before helping others!